The wave broke over the engine cowlings. We were crabbing into the current, stern-to to the white-frothed waves rolling over the reef. The tide was ripping out at 3 knots, the wind from the west was blowing 10 knots, and the submerged rock was 10 yards away on my starboard side. Wreathed in white foam, its hoary, green, slimy head poked out each time a big wave swirled around it. I was on the wheel, in a sweat, never mind the humid summer air, trying to hold the boat in position. Andy and Tom, both standing in the bow, were nonplussed. Their “watch the rock” comments would occasionally sally forth as they whipped their lures out, teasing stripers into performing spectacular aerial hits. “Thanks, fellas,” I muttered — as if I didn’t see the boat-eating monster lurking. A close replica of a Reverse Atom, the Magic Plug imitates a fleeing squid, driving stripers into acrobatic strikes. Andy could easily cast 50 yards with his lightweight rod. 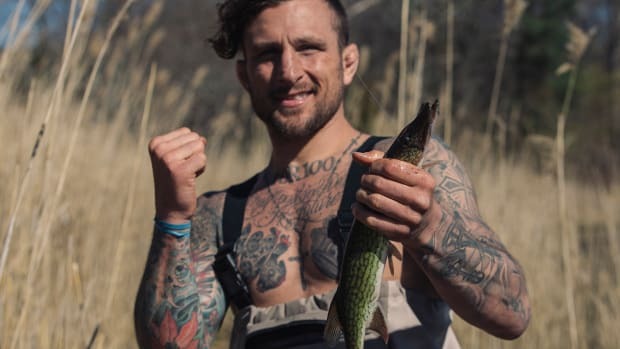 With his gymnast’s wiry body and thick, muscular hands, he would put a bend in the rod, placing the lure exactly where the fish were breaking. Tom, a tall, athletic man, was equally adept. Both were men of few words, comfortable on the water. They had fished the rips off Watch Hill, Rhode Island, for years. 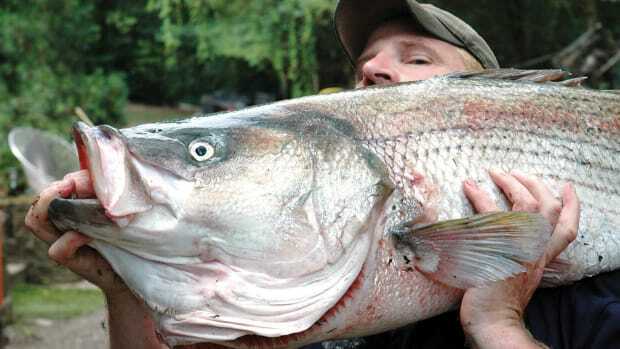 They knew the bait, the right stages of the tide to fish, the right lures to throw and so forth. Their differences at the moment centered on exactly where the rock was, relative to our position. I held the wheel, listening to these two grizzled fishermen in their oilskins debate how close we should get to the rock. My amateur-looking golf shirt and khaki shorts were soaked, my boat shoes full of water. Other boats were lying off our quarters, envious of our success in catching fish, slowly trying to slide into our primo position, not that it would do them much good. We weren’t moving. Besides, our success was based on more than our position. Our secret was the lure, which Andy had dubbed the Magic Plug. And it was not one you could buy in a tackle shop or online. This batch came out of Andy’s basement. Andy and Tom cast the amber-colored plastic surface plugs at the fish. 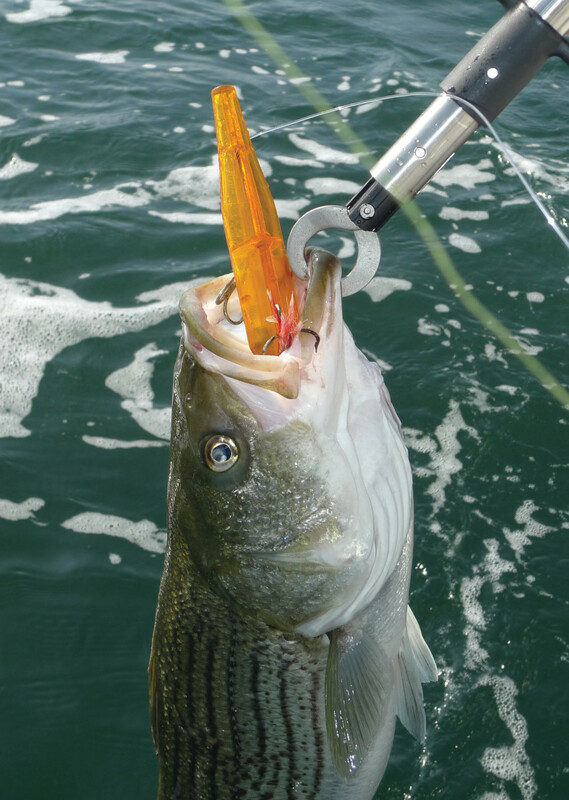 No sooner had the lures hit the water than, presto, we had a bent rod and another striper, thank you very much. I don’t have the experience of Tom or Andy. Looking at the plug for the first time, I wondered why a fish would hit such an ugly piece of plastic. But Andy knew, as would any New England striperman with a sense of history (see companion story below). 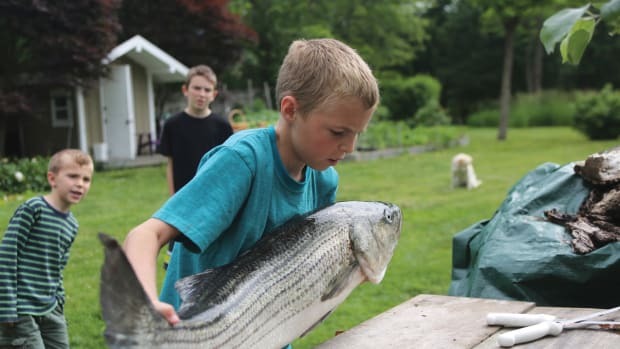 Andy Gagarin has an advanced degree in ways of the striped bass. I met Andy Gagarin in Islamorada, Florida. That’s why I flew there to fish, which is why Andy lives there in the winter. Our wives, friends from Watch Hill, arranged for a dinner out for all of us at what passes for fine dining in the land of deep-fried conch fritters. “Separate checks,” Andy told the waitress at the restaurant as she handed out the menus. Then, silence. He had already explained the reason for the decline in Florida’s fish population, leaving it to me to make any remaining conversation. I’d spent years running companies, hiring and firing more people than I can recall, and had gotten pretty good at sorting out the wheat from the chaff. One of my rules was always to hire people who are smarter than you. I have found that works with making friends, as well, and it’s not a high bar for me since all my friends have skills that I don’t. Andy, I would learn, had more skills than most, and then some. Andy, who is 74, was special. He didn’t show it. You had to peel the modesty back before you could enjoy the intellect. Three pelicans cruised by the restaurant’s second-floor veranda. They looked more interested in me than Andy did. By the time the second squadron flew by I had resigned myself to looking interested when our wives talked about where to shop. “You like to fish?” Andy asked. Got it, I thought. He speaks when he feels he has something useful to say. Otherwise, why bother? Andy turned to face me. When you find something that works really well, you go to great lengths to stay with it. 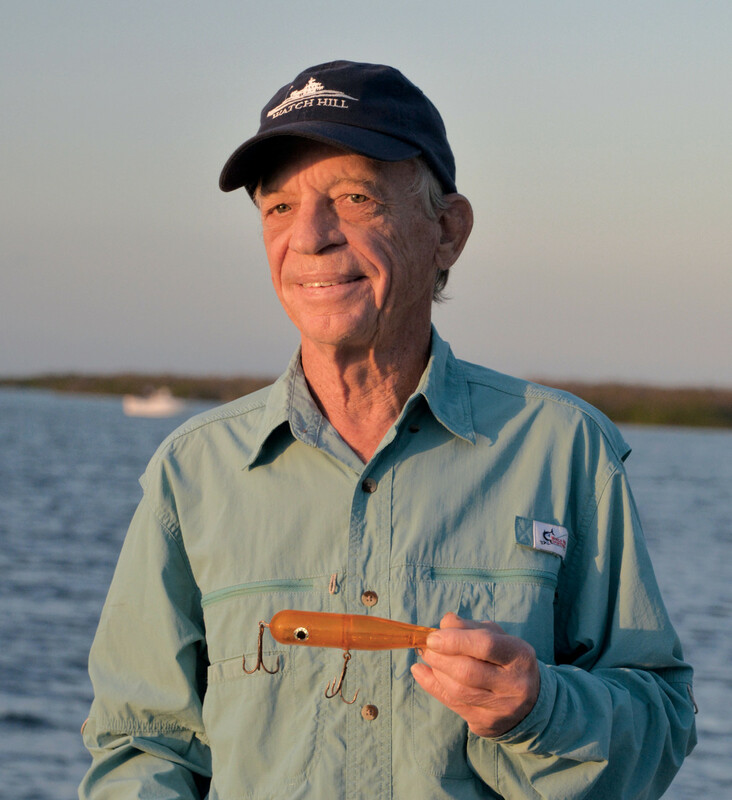 I hadn’t traveled 2,000 miles to the fishing capital of the United States to eat a thin, gristly piece of meat, but I did recognize a man who not only liked to fish, but who also liked fish. What became obvious during the meal was his patience. When he spoke, you knew you were hearing something meaningful, often laced with wry humor. As the evening wore on, he spoke to his passion for persuading a fish to believe that his lure was live bait, a terrified squid. He had no interest in killing them. His hooks were barbless. He mentioned that he had a special lure I would only see when we got back to Watch Hill. Sure, I thought, and didn’t think any more about it. Watch Hill is one of those storybook old Yankee summer resort villages you find in romance novels. Largely deserted in the winter, it’s full of old, rambling, weathered, cedar-shingle-sided homes that perch on bluffs and hollows overlooking Block Island Sound. The place doesn’t come alive until the forsythia and daffodils bloom. The same families have summered there for years, one generation gracefully sliding into the next. The village is old enough that houses are identified by the name of the original owner, creating a sense of identity that adds to the charm. Andy, I discovered, had summered in the same house since birth, and before him, who knows how many generations. Back in Watch Hill with our boat safely launched, I know I sorely tested Andy’s patience. Once I promised never to reveal where and how we fished — a formality he insisted upon — we both quickly realized that although I was adept at handling a boat, what he called fishing was completely above my skill level. There is fishing, and then there is what Andy considers fishing. Most people who summer in Watch Hill have fished at least once. 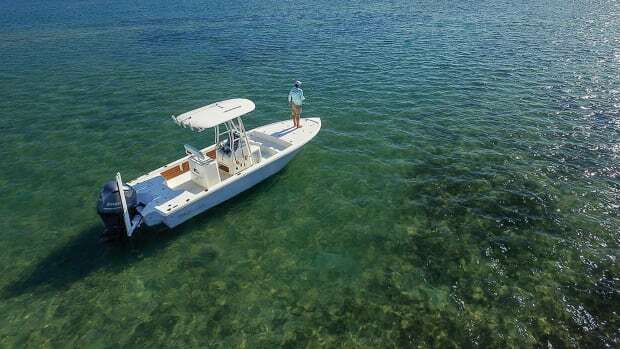 Friends’ boats are plentiful, and the reefs are a mere 20 minutes from the harbor. The typical experience consists of weaving around lobster pots with a couple of trolling rods out, a languid sortie done only in perfect weather. If there’s never a fish, so be it. Any foray on the water is good for cocktail chatter, proof that you are a seasoned member of the community. Andy was aghast when he saw my gear. Not only were my rods inadequate, but also the reels were old, and the line needed changing. Oh, and I couldn’t cast very well. He never wavered. We had a deal on the boat, and that was that, which is how I ended up buying a whole new outfit and standing on the seawall of a lighthouse, practicing casting under his watchful eye. If he despaired at my lack of coordination, he never showed it. Short or long, my casting didn’t really bother me. I had arrived. On the way to the seawall I’d been invited into Andy’s inner sanctum: his workshop in the basement of his home up the hill from the lighthouse. It was a glistening paradise of tools, drills, saws, milling machines, fasteners, molds — you name it, shelf after shelf. Standing there transfixed, I failed to notice that he had burrowed into a mound of plastic boxes off in the far corner. He emerged triumphantly, holding a plastic container. Sweeping aside the debris on the worktable, he opened the case and presented me with a long, amber, tubular, hollow lure. It had a pair of treble hooks hanging off it. his hands, rubbing the seam that ran down its length. He then became more talkative than I’d ever imagined he could be. Andy described the entire story behind the original lure and his efforts to copy the plug. How he’d met the older gentleman who was manufacturing the replicas, eventually buying out his supply of finished plugs and half plugs, which he would assemble. Now I became the man of few words. How this plug, which looked like nothing that swam in the ocean, would attract fish was a mystery to me. 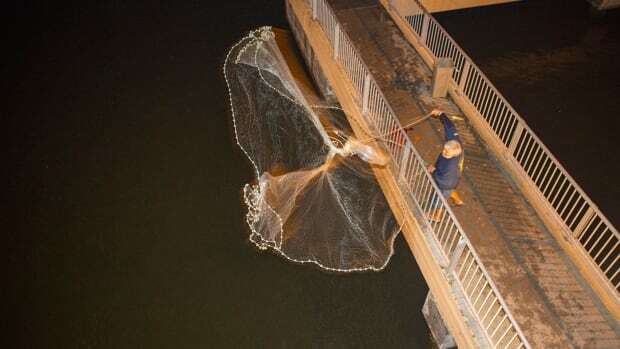 We had to fish it to reveal its power, which is how I found myself crabbing into the tide, holding a position between a buoy and the lighthouse, watching Andy and Tom reel in stripers, one after the next. I did keep the boat off the rock. And Andy’s still talking to me. Whatever he might want to say next, I’m ready to listen. The Magic Plug is a close replica of the Reverse Atom, which dates from the late 1940s or early ’50s. It was designed to imitate the color and swimming pattern of squid fleeing marauding stripers. 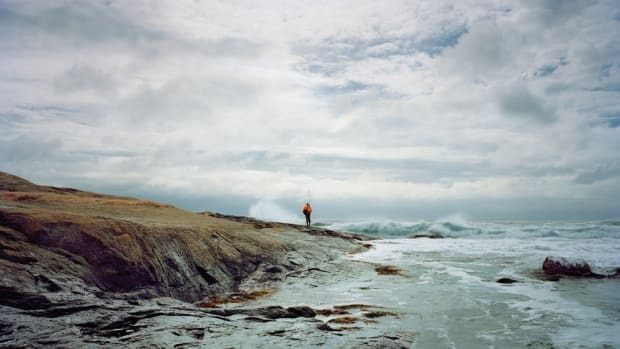 About 20 years ago, when squid and big bass converged each spring on the reefs off Watch Hill, Rhode Island, Andy Gagarin fished a poor imitation: a hollow, orange plug he’d bought at a tag sale. The lure knocked the snot out of the fish for two days before a bluefish swam away with it. That started Andy, who owned a couple of the originals, on a quest to mold his own Reverse Atom replicas. The trial-and-error process took a couple of seasons and involved making molds; getting the proper resin, wall thickness and color; waterproofing the halves and so forth (that last bit could be a story unto itself). After several seasons, serendipity struck. 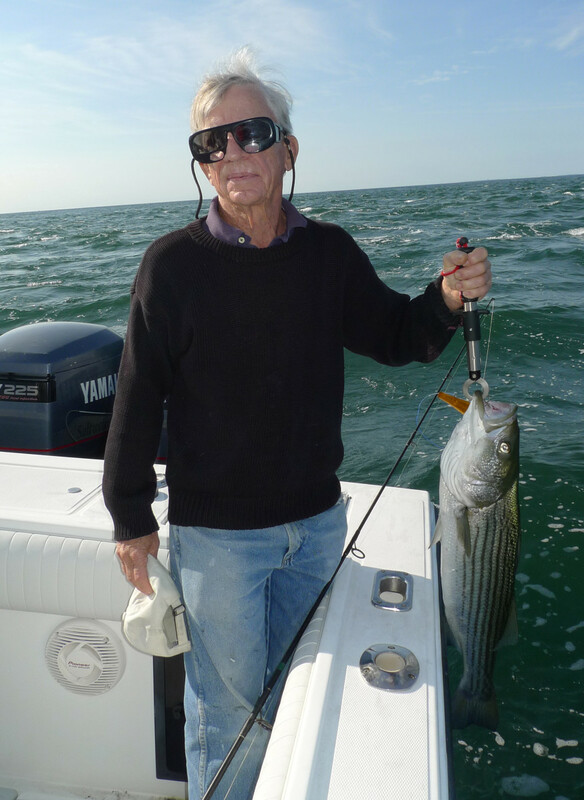 Andy became friends with a Providence, Rhode Island, tool-and-die maker and avid fisherman named John Anterni. 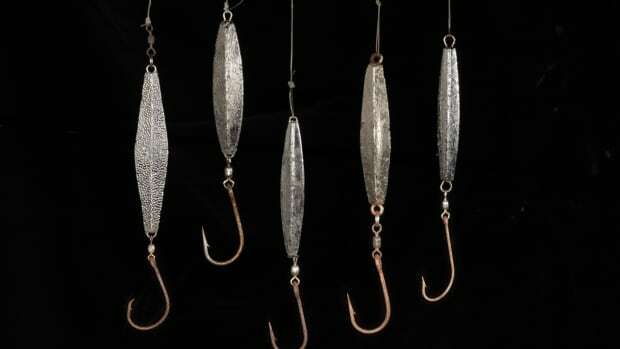 An expert in mold making, Anterni had also started a lure company called Anco Lures, which, Andy says, produced slightly smaller copies of the original Reverse Atom, along with other lures. Anterni died five years ago at age 90. 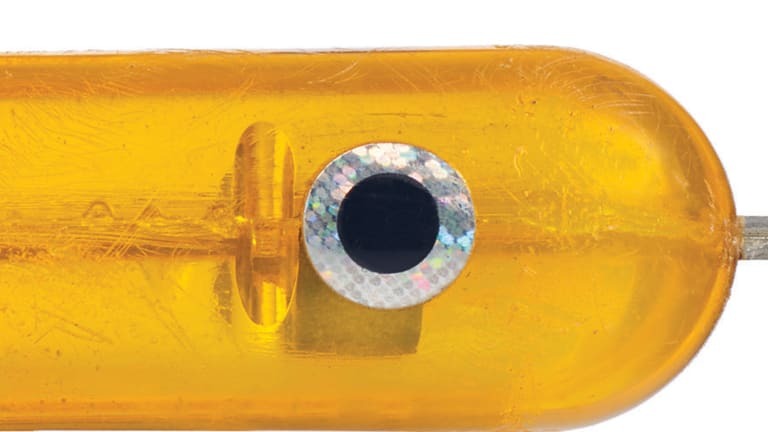 A few years before he passed, Andy calculated how many Magic Plugs he and his friends would need to fish the rest of their days and bought out most of the stock — about 150 finished plugs and more than 400 halves, with the weights included. Become a better saltwater fisherman. 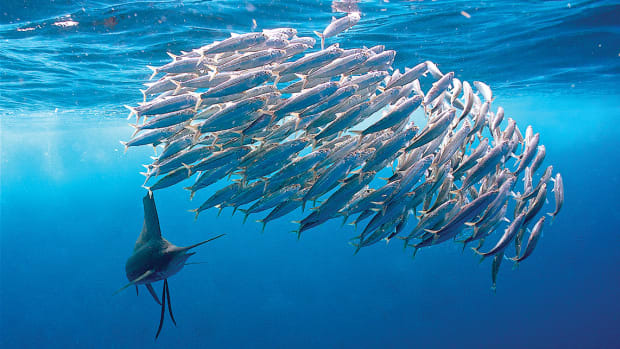 Check out our Boaters University course, Anglers Bootcamp: The Basics of Saltwater Fishing. 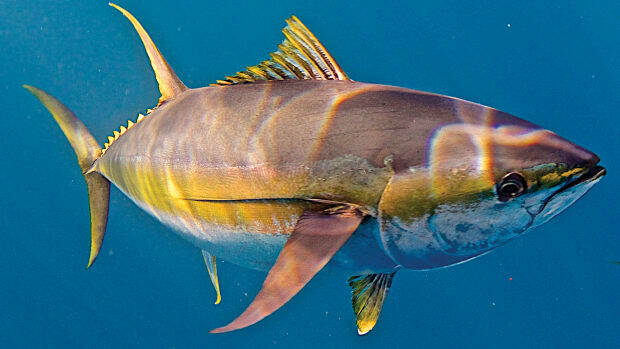 A comprehensive overview of the basic components necessary to become successful as a saltwater angler. Sign up today and use the coupon code: ANGLERSJOURNAL for 15% off.